AUM Fees vs Commission Sales Charges – Which is Cheaper? If you purchase a financial asset in this time and age, you have to pay a cost for it. And cost matters a lot. Why do Cost Matter in Investing? Consider this. If you put $10,000 in a unit trust, you do not know in 10 years time what kind of returns you will get. It could be 3%/yr, 5%/yr, 7%/yr or it could be -2%/yr. Stock and bond markets are forward looking and we try to draw from our experience in the past experience to predict future returns but it is a hard job. The cost on your unit trust, such as the management fees and the sales fees are easy to predict. It is levered on what you purchase in the funds terms and conditions. So if a unit trust earns 5%/yr for 10 years before fees incurs a total of 2%yr in fees, your returns is shaved. The power of compounding is applied on returns. The power of compounding is also applied on costs. And this is not constrained to unit trust. If you purchase exchange traded funds (ETF), which people say are better than unit trust, individual bonds, preference shares, stocks, there are sales charges and commissions. So minimizing costs give you a boost to your eventual returns. With that in mind what are sales charges? The financial products you purchase have charges if you purchase, if you sell or if you switch from one product to another product. Sales charges are also known as front-end fees. These are not the only costs, as I am just highlighting some sales charges that are largely similar. What are Platform AUM Fees? In recent times, these financial firms have tried to change their charging model. Instead of paying a upfront fee one time, they charge you a recurring asset under management (AUM) fee for using their platform. Fundsupermart was a unit trust platform that switched from a sales charge model to a AUM Fee model. This is made more prevalent as Fintech companies such as Stashaway, Autowealth and Smartly also adopt this management fee model. The able above shows the AUM fees for some of the latest Managed ETF companies or Roboadvisers, Unit Trust Platform Fundsupermart and Fee-Only Advisory Firm Providend. The 3 Managed ETF platform charges a range of AUM fees per year. This will depend on the amount you have under management. Autowealth has the most uniformed fees which is 0.5% + $18/yr. StashAway is the cheapest if your AUM is high, but both Stashaway and Smartly is rather expensive if the AUM is small. They don’t have sales charges though. I also listed local Unit Trust, ETF, Bonds and Stock shop Fundsupermart AUM rates. Their fees are much lower than that of these managed ETF platforms. I also included solutions for accredited investors and high net worth solutions from Providend. Providend makes use of Dimensional Fund Advisors Index Funds in their wealth accumulation and de-accumulation solutions. For their non aggressive portfolios, the AUM fee is 0.50% while the aggressive portfolios it is 1%. Finally, what if you purchase a portfolio of ETF yourself? DIY Brokerage Stocks lists the local and international AUM Fee. There aren’t any AUM fee for local listed ETF, but for international ETF listed in USA, Canada, Australia, UK, there is an absolute custodian fee, on top of dividend handling fees and buy & sell transactions. The local ETF will incur buy & sell transactions. Those platforms that leveraged AUM fees typically do not have sales charges. Those platforms or ways that have sales charges tend to not have AUM fees. Then there are some platforms, such as Fundsupermart’s DIY ETF solution that have both sales charges and AUM fees. If cost matters, then we should minimize our costs. Suppose Kyith is a wealth builder that wants to put away $20,000/yr into wealth accumulation. Kyith will attempt to accumulate over 20 years. The average rate of return is 6%. In #1, Kyith will pay commissions when he buys/adds to his assets. Kyith will also pay commissions when he sells/reduces from his assets. Kyith will also incur commissions if he does an annual rebalancing. In #2, Kyith will pay annual AUM fees but typically he is not charged when he buys, sells or does rebalancing. In terms of numbers how does the 2 compare to each other. 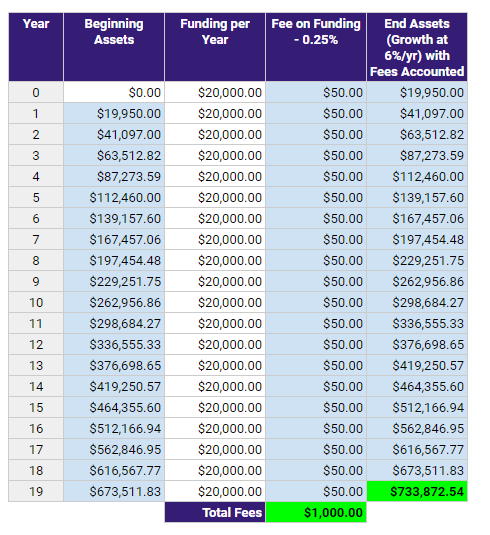 If I look at the average, the average AUM fee is 0.50%. Kyith would have contributed $400,000 in total and it would have grown to $697,366 at the end of year 19. The fees started off little but starts to accumulate at the end. 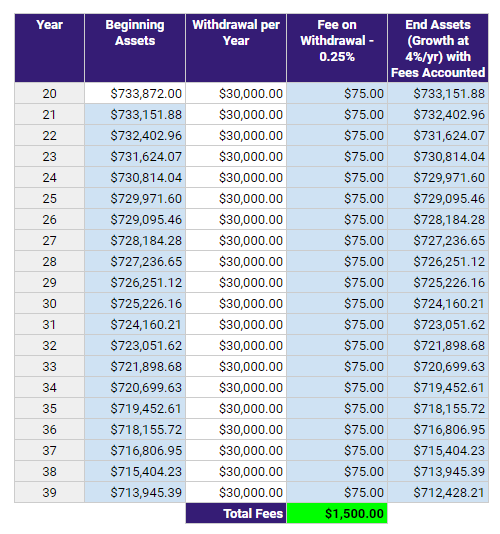 In this 20 year span, Kyith would spend $27,033 in fees. 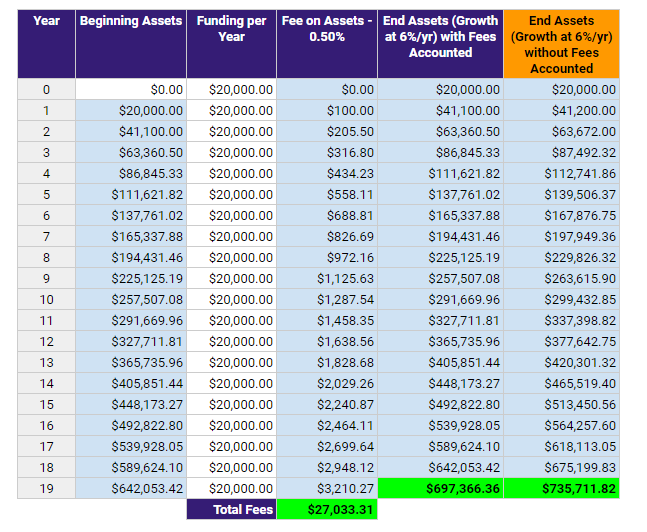 I also put a column at the end to show the amount of assets Kyith would have accumulated had he not have any AUM fees. The difference is $38,400. If Kyith does not choose such a platform, but instead do it yourself by managing his ETF portfolio on his own, he would incur sales commission on buy and sell. We take it that Kyith’s buy and sell commission is 0.25% of the transaction amount. For reference 0.25% is probably the more expensive one. Local brokerages leverage 0.18% + 0.20%. Standard Chartered Online Trading is the most expensive one at 0.25% for their overseas stocks. Kyith would have put in $400,000 and accumulated $733,872. This is more than that of the AUM option. The total fees incurred is $1000 which is so much less. The fees would even be less if, in the future brokerage rates become more competitive. However, this $1000 is only part of the picture. Kyith only spent commissions when he buy to accumulate. What if he buys and sell to re-balance the portfolio? In the AUM model this would be free but in this case Kyith will incur a buy and sell charge. Kyith will also incur commission when he sells. The table above shows the 20 year wealth withdrawal, continuing from the previous example. The growth rate of the portfolio is reduced as well. The total fees add up to $1500. If we add up the fees for accumulation and withdrawal it is $2,500. This compared to $27,000 in the AUM. While we have not factored in the cost of rebalancing, the sales commission model still have a lot of room to work with before cost equates that of the AUM fee model. My original thought process was rather naive. Many people gripe at the 0.50%/yr AUM fee. If we think about it, under the traditional brokerage model, we have to pay 0.25% buy commission and 0.25% sell commission. So the 0.50%/yr AUM fee does not look out of place. However, as I sit down and think about it, I realize the horror how wrong I was. AUM fee is applied on growing asset base. Buy and Sell transactions are applied on a much smaller transaction amount. This probably make iFAST Financial (listed on the SGX) such a good business if their AUA keeps growing. Platform AUM Fees and Sales Charges are Not the Only Costs. There are other Considerations. What makes these comparison more challenging is that the platform fees are just part of the cost. There are some qualitative benefits to use particular platforms that the traditional brokerage cannot provide. I will briefly list out some of them. Dedicated Personal Advisory Team. Providend compared to the rest of them, lets their clients access to tried and tested quantitative index based products through their platform. Their platform gives you an access to human advisory team which the other platforms do not or if you do it yourself. Automated Portfolio Allocation and Re-balancing. The managed platforms have a particular methodology to how you should allocate your assets. The platform helps you to automatic re-balance your portfolio to create a little out-performance. If you do it yourself, you have to be sophisticated enough to know how to carry this out. StashAway, AutoWealth, Smartly, Fundsupermart MAPS, Providend all fall into this camp. Automated Funding into Portfolio. Some of these platforms allow you to automatically fund the investment on a recurring basis, unless you issue an instruction to stop it. This reduce the hassle of having to login to your brokerage platform to put a buy transaction. If a human is involved in the transaction, they might withdraw from making the funding due to their perceived direction of the market. This may be detrimental to the portfolio. Access to Specific Strategy. By using these platforms for your wealth accumulation, you get the company to manage your funds through certain strategies. This could be life-cycle allocation, regime based allocation, aggressive portfolio, conservative portfolio. tashAway, AutoWealth, Smartly, Fundsupermart MAPS, Providend all fall into this camp. Each platform and each underlying instrument would have different costs. To be clearer about the costs of what you bought into, you have to find out what is the underlying assets your platform purchase, what is the expense ratio and estimate how much, together with platform fees you are paying. While the unit trust platform seem to have lower platform AUM fees, the expense ratio of the unit trust funds are also higher. This offset the cost advantages of the unit trusts in Fundsupermart versus that of ETF. While I use 0.25% as brokerage commission, the sales charges levied by investment linked policies (ILP) and some other unit trust platform might be higher than 1%. If we are comparing platform AUM fees to sales charges, there is no fight. We should always prefer sales charges if the sales charges are cost effectively done. For example, instead of paying minimum charges of $10 or $25, accumulate enough money so that you put in semi annually or annually. 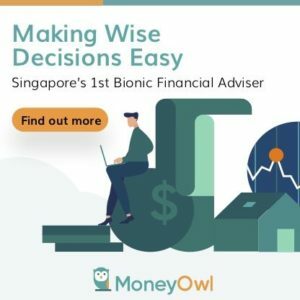 However, the appeal of some of these managed funds platform is that they provide some form of automation that takes away the behavioral aspect of investing, gives you access to some strategies that will be difficult for you to manage yourself. If you are the kind of wealth builder that understands the methodology, yet would like to be hands off in your investing, you got to pay some of the cost. However, at the end of the day, cost still matters. I don’t know why you did not mentioned POEMS and Dollardex. They are both provider which sells UT without service charge or platform fees. Nowadays people who use FSM is not being smart especially when both POEMS and Dollardex have more or less the same funds as FSM without the need of paying anything. Hi Green, I wonder how sustainable they are. They don’t charge sales, they don’t have AUM fees. So how do they make a business? The industry talk is that Dollardex, now part of Aviva is loss making. FSM you can see the financials. They get a cut of the funds’ management fees e.g. instead of all 1.5% going to the fund mgr/fund house, 1% goes to them while 0.5% goes to the distributor i.e. DD or Poems. To get a profit, the distributors will need to attract large AUM and/or run a lean operation. I guess this is also a reason why the minimum sustainable fund size has been going up over the years — if a significant portion of fees need to be shared with distributors, fund mgrs need larger AUM just to cover the basic manpower costs. BTW a lot of US mutual funds have been run this way for many years liao as funds started to go the no-load (zero sales charge) way in earnest from the mid-1990s. I think the trailer fees is how they earn the money. which is misleading and should be declared. So they are twisting the advertisement. Thanks for this comparison Kyith. I wish we had similar kind of platforms as in the US: Vanguard, Betterment and Co. I feel Singapore is lagging behind in this sector. (perhaps to protect the big margins of local players?). Smartly is a good try but fees are way too high compared to the above mentioned. There is also a company called 8Now! in HK that charges… 0.88% AUM obviously. On a completely different note, Vanguard and Betterment ETFs became so popular in the US that we can start to see that ETF are now driving the stock prices which defeats the purpose of investing in ETFs. Hi Regis, individually Vanguard will not come because their index funds do not have sales charges. So there are no firms in Singapore that will carry them. Betterment and Vanguard if i am right have a platform fee as well. Vanguard personal advisors charges 0.30% and Betterment is around there. You may be right. if they are so popular that people throw money at them, and they have to invest, the ETF must have a smartway to buy so as not to jack up the price. Thanks for consolidating the cost across different investment vehicles Kyith. I wonder how did you get $24/year per counter capped at $150 per quarter (i.e. $600 per year?) for foreign ETFs? I am a novice thinking of investing into World ETF and S&P ETF. HI Wio, if you look at the various brokerages e.g. poems, kim eng and lim and tan and look under international stocks, they will list out the custodian charges and dividend handling charges. They are typically per quarter so that is where i get my data from.